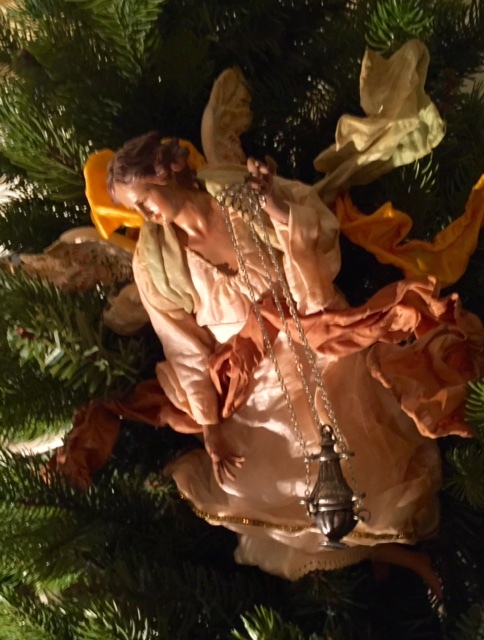 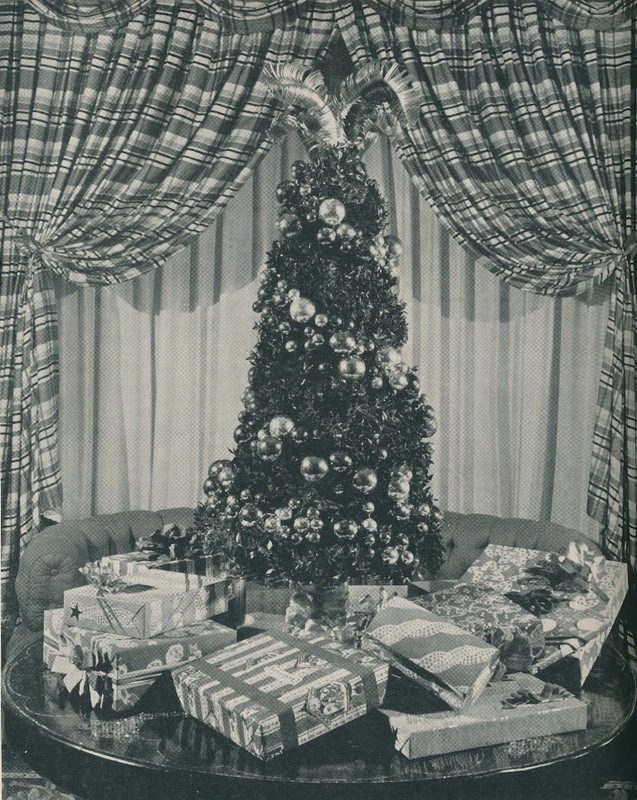 The look of Christmas may have changed through the decades, but the sentiment remains the same. Wishing all of you a joyous Christmas and health and happiness in the New Year. 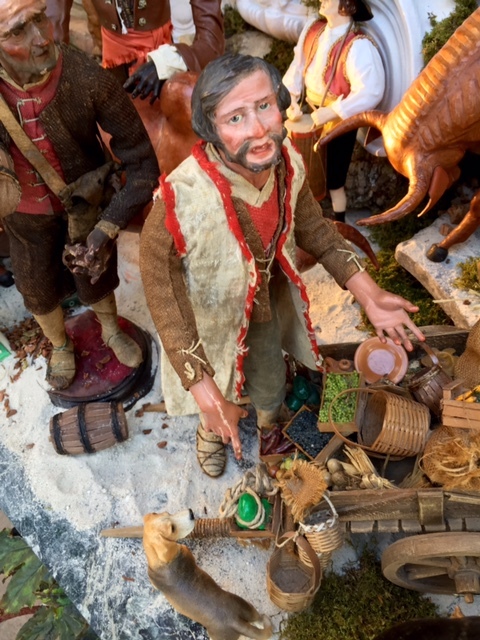 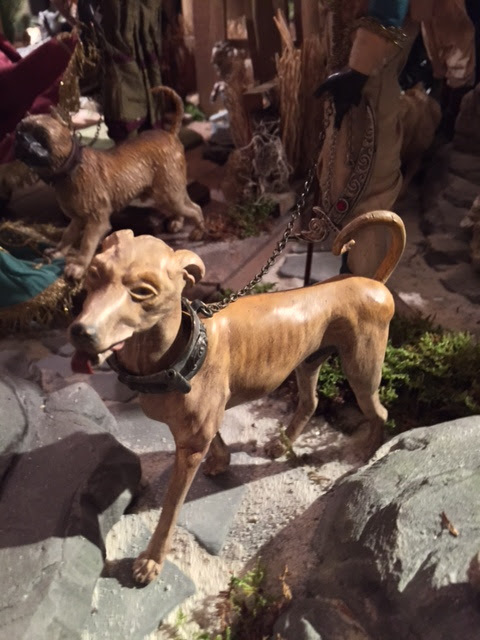 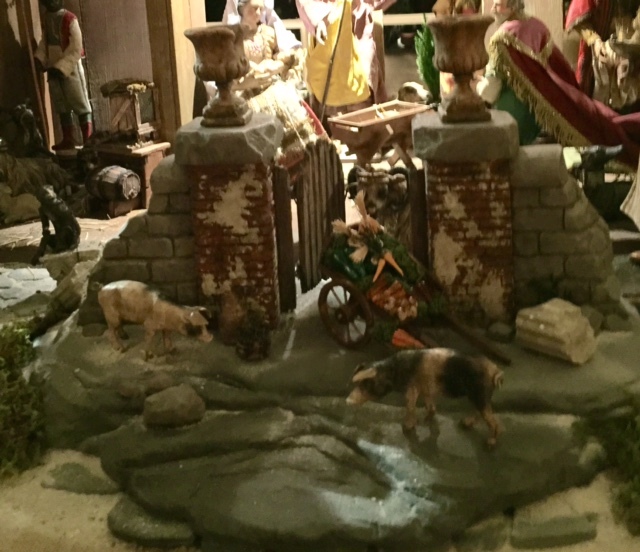 If, like me, you're enchanted by the Christmas tradition of the crèche, then this blog post is for you. 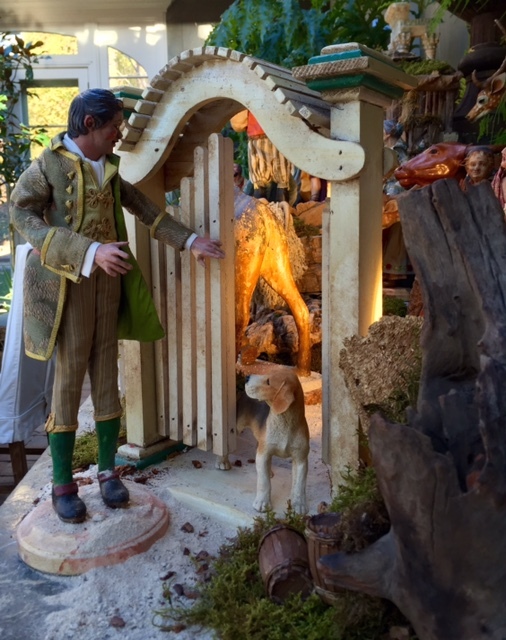 My friend, Jonathan Preece, recently sent me photos of a Neapolitan crèche that he staged in a Mill Neck, New York house. 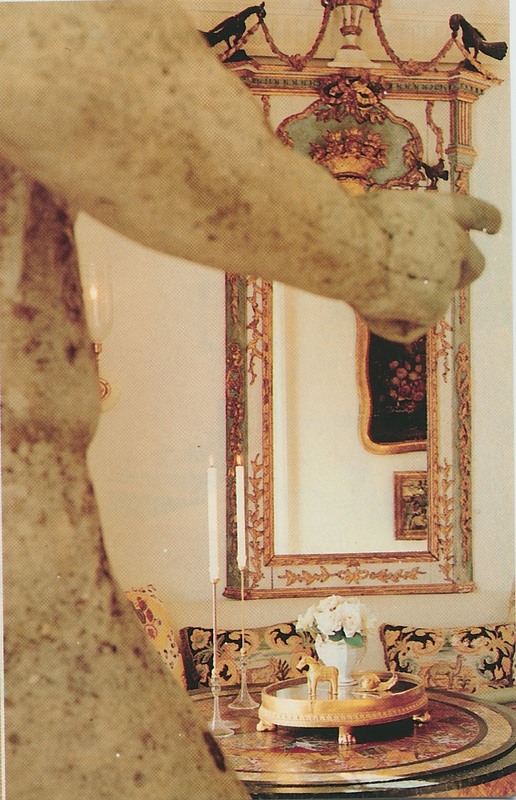 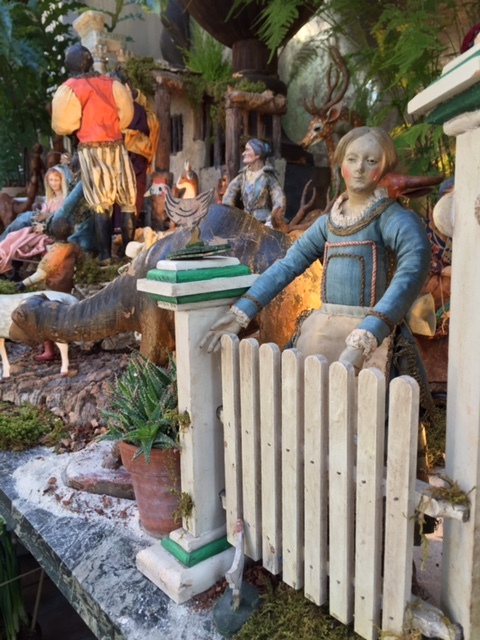 The homeowners, who are clients of Bunny Williams, Preece's employer, were inspired to start collecting antique Neapolitan crèche figures after learning of the impressive collections of both Williams and her husband, John Rosselli. 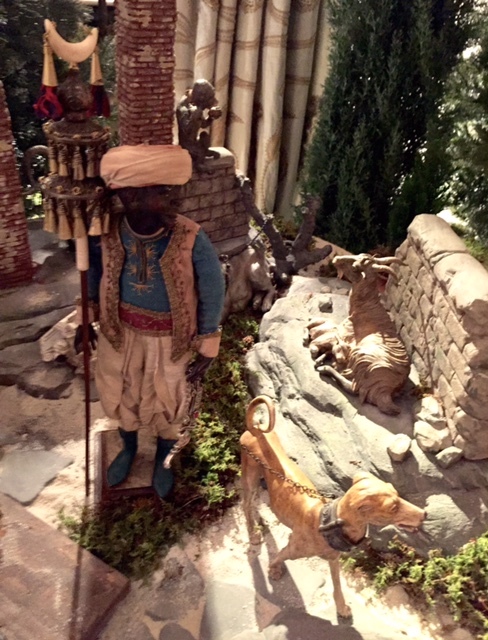 The tradition of the crèche, or nativity scene, can be traced back to 1223, when Saint Francis of Assisi created the first one using living figures. 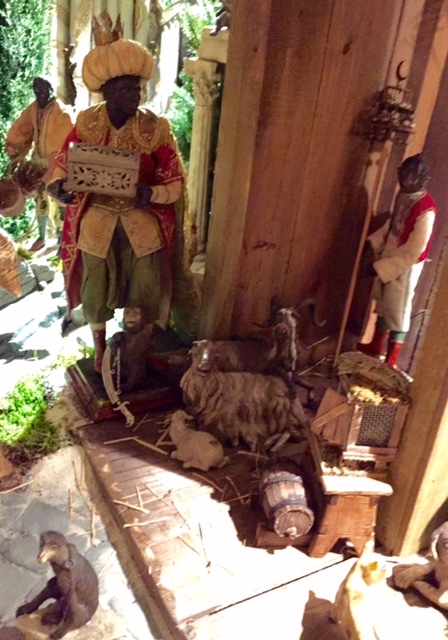 Meant to represent the Nativity, or birth of Christ, a crèche includes the figures of baby Jesus, Mary and Joseph, Angels, the Magi (or Three Wise Men,) shepherds, animals, and, sometimes, townspeople. 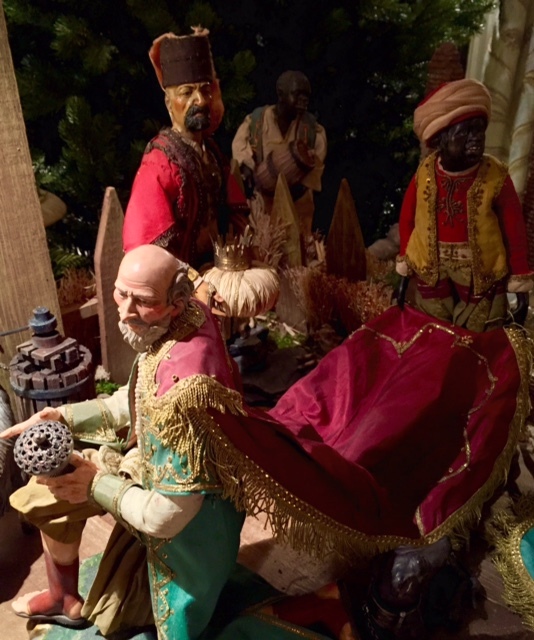 According to Jonathan, these crèches reached a height of artistic excellence in eighteenth-century Naples, Italy, where this traditional craft is still being practiced today. 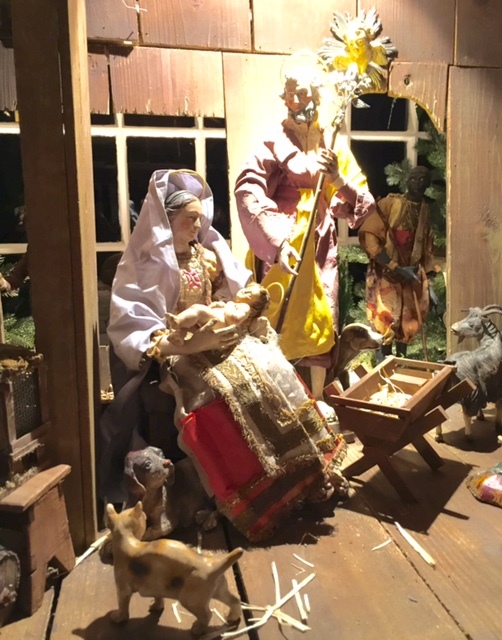 One of the more famous Neapolitan crèches is that at the Metropolitan Museum of Art, which draws crowds every Christmas. 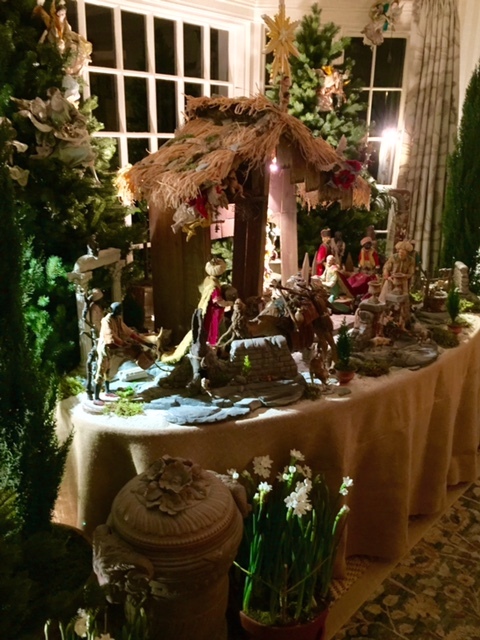 In the Mill Neck house, Jonathan has assembled the crèche on a table set in the bay window of the dining room. 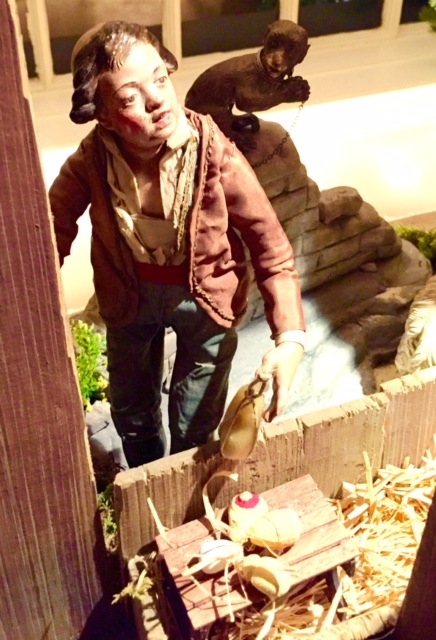 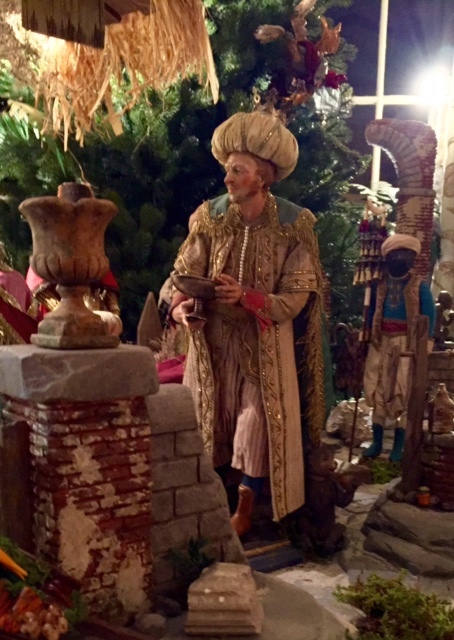 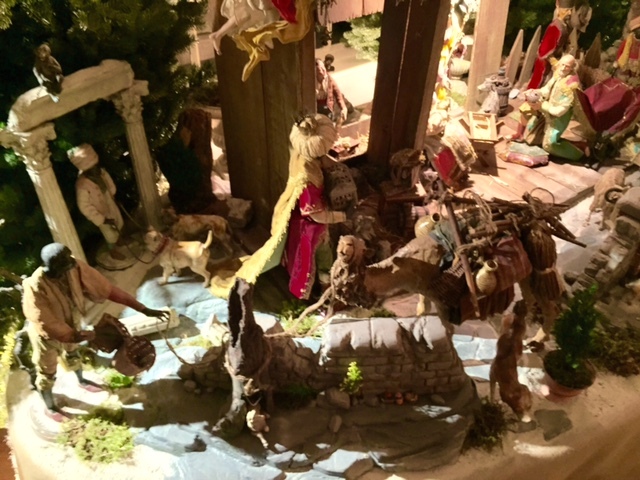 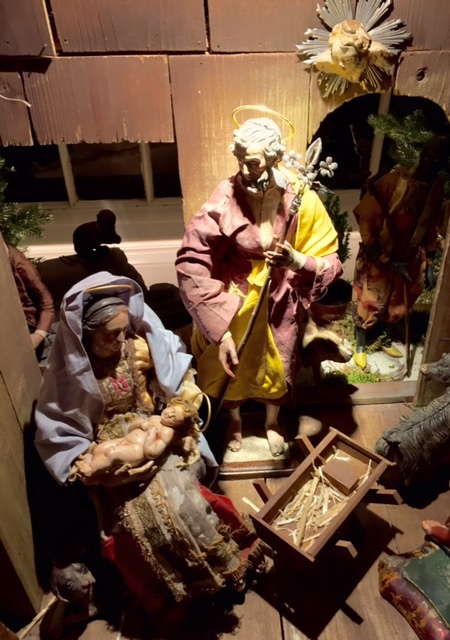 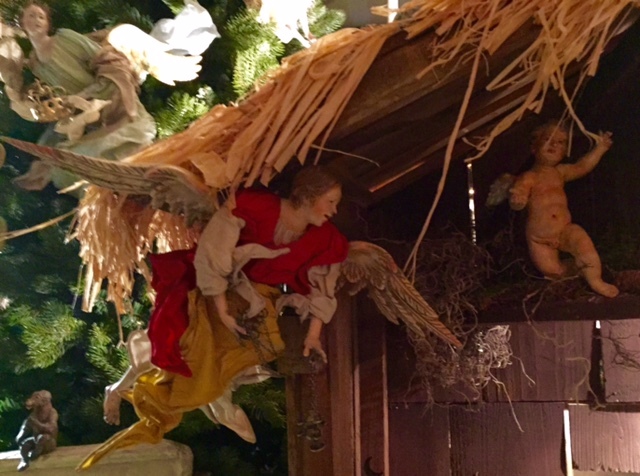 The traditional stable, which, of course, holds baby Jesus and the manger, was made by Charles Dort, while artist Ron Genereux created the crumbling walls, fences, and Classical ruins out of foam and clay. 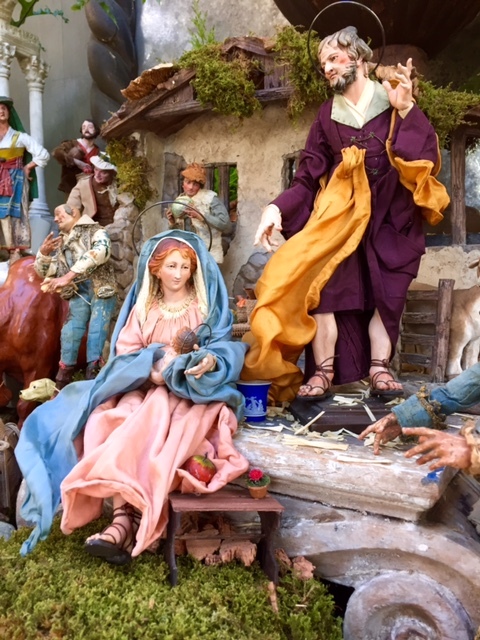 Placed against this landscape are the antique Neapolitan figures, whose heads, hands, and feet are made of painted terracotta and whose bodies are fabricated from wire wrapped in hemp. 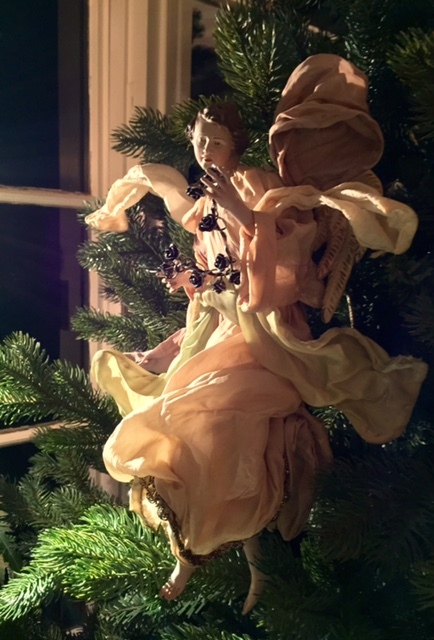 The figures' clothing is mostly silk and linen, with many of them bearing delicate embroidery. 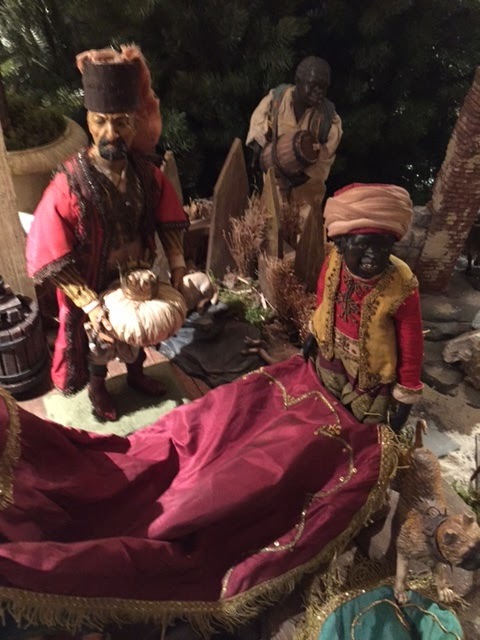 (Make sure to expand the images of the Magi, below, whose costumes are exquisite.) 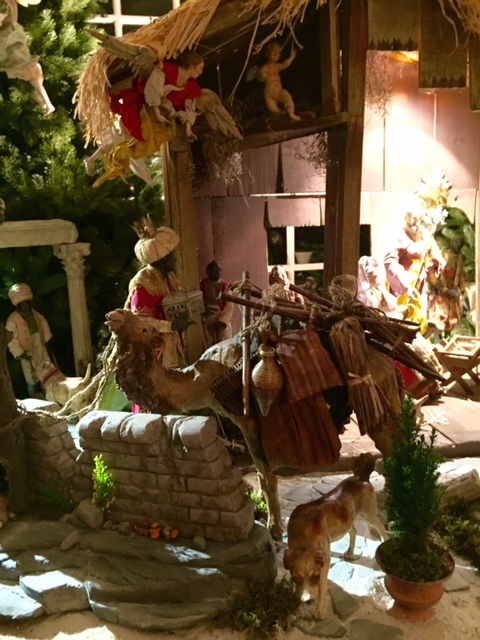 And placed gingerly around the scene are small spot and up-lights, which provide "magical illumination," says Jonathan. 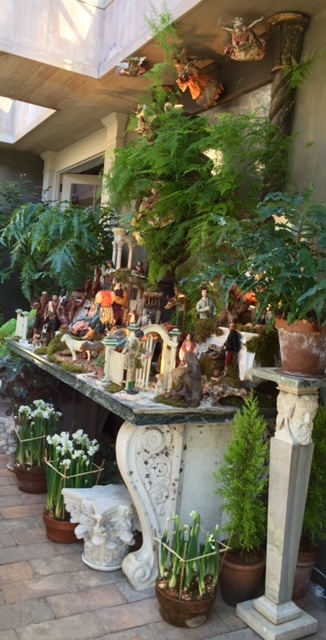 Finally, around the edges of the crèche are Columnar Cedars and Cypress, terracotta oil jars, urns, and mossy-clad pots filled with White Narcissus. 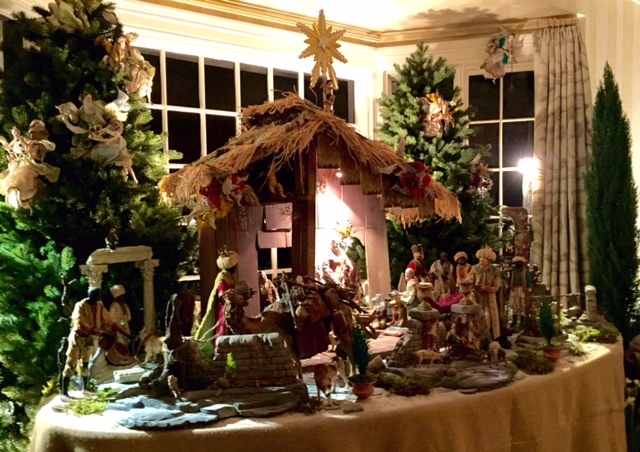 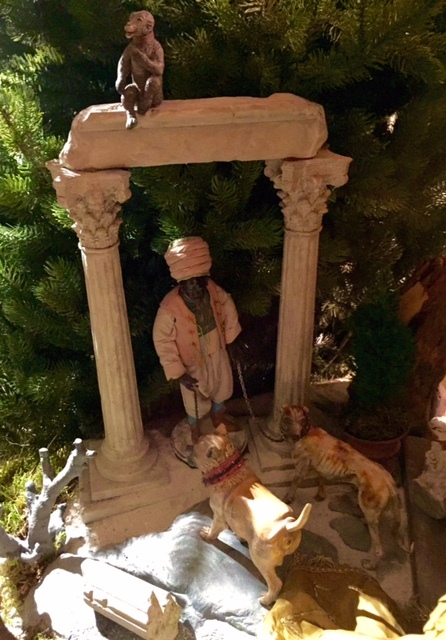 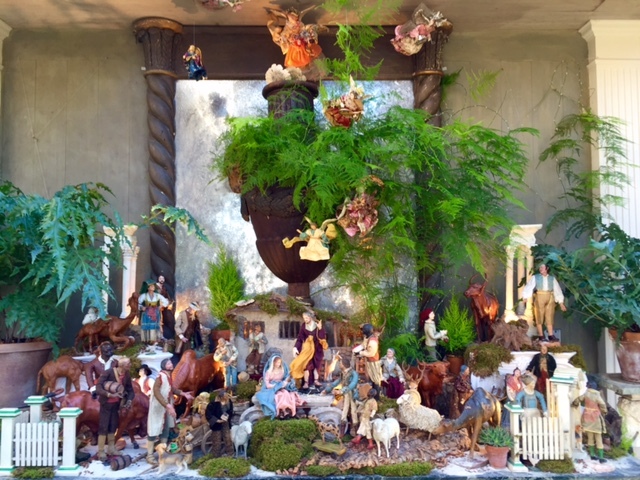 As a bonus, Jonathan also sent me photos of Bunny Williams' spectacular Neapolitan crèche, which Jonathan assembled on the Conservatory console in Bunny's Connecticut house. 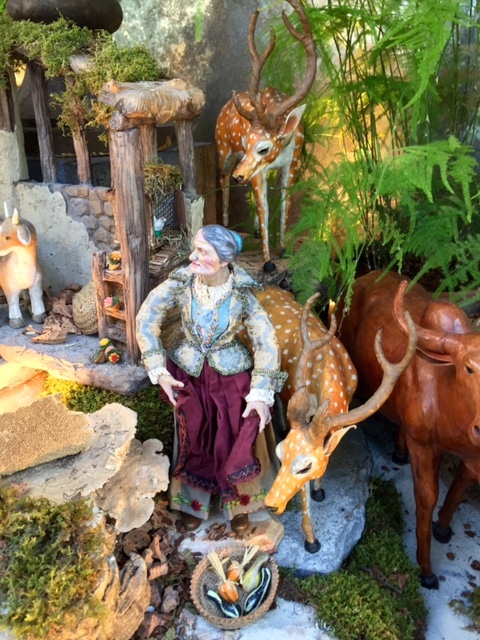 Alongside her antique Neapolitan figures, Bunny has added pieces that are not so period, such as leather bulls and animals from India. 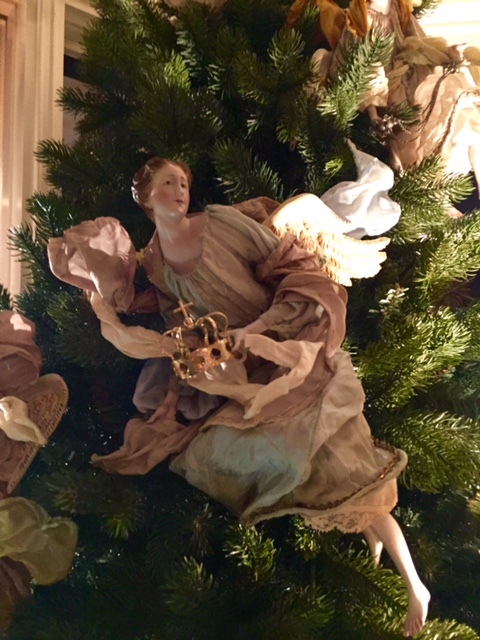 The effect is a delightful celebration of the Christmas season. 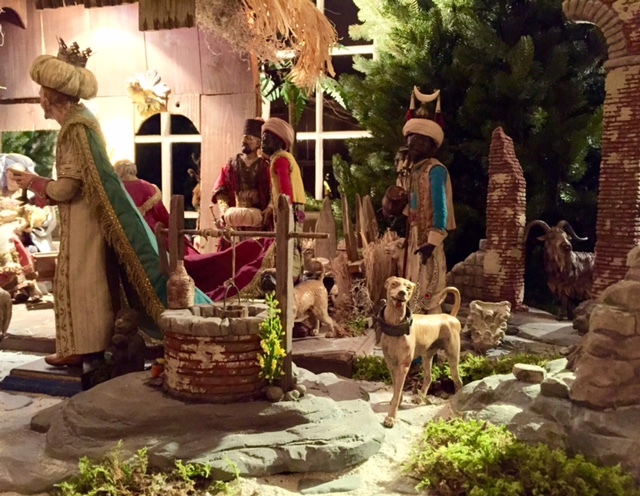 You can see photos of Bunny's crèche at the bottom of this post. 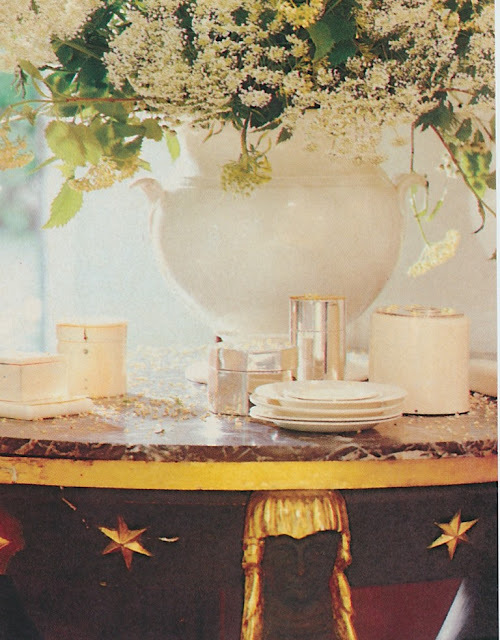 A reader recently suggested that I write about Boston designer William Hodgins, whose work has been woefully absent on my blog until today. 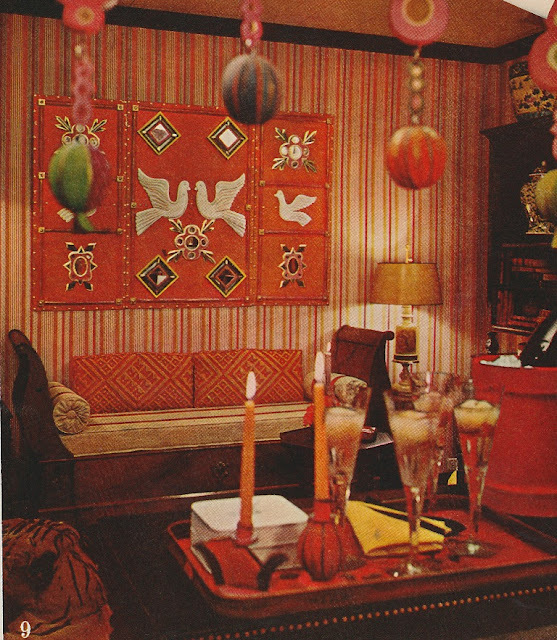 Hodgins is, in a way, like designer Dan Carithers. 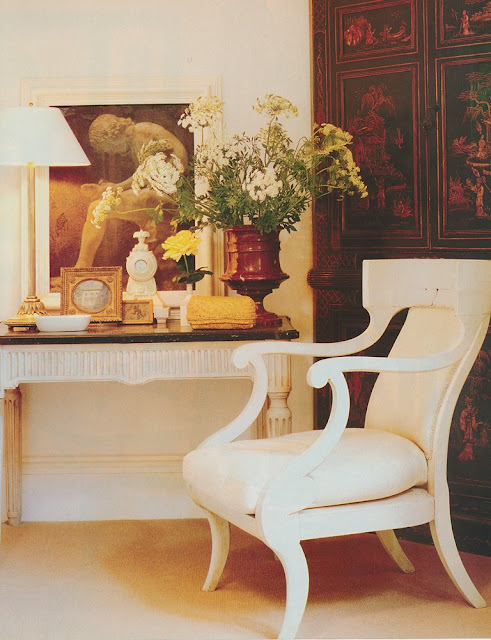 Both men eschewed New York for Boston and Atlanta, respectively, and yet, despite not living in the epicenter of the design world, managed to forge high-profile careers and earn their places in the annals of American design. 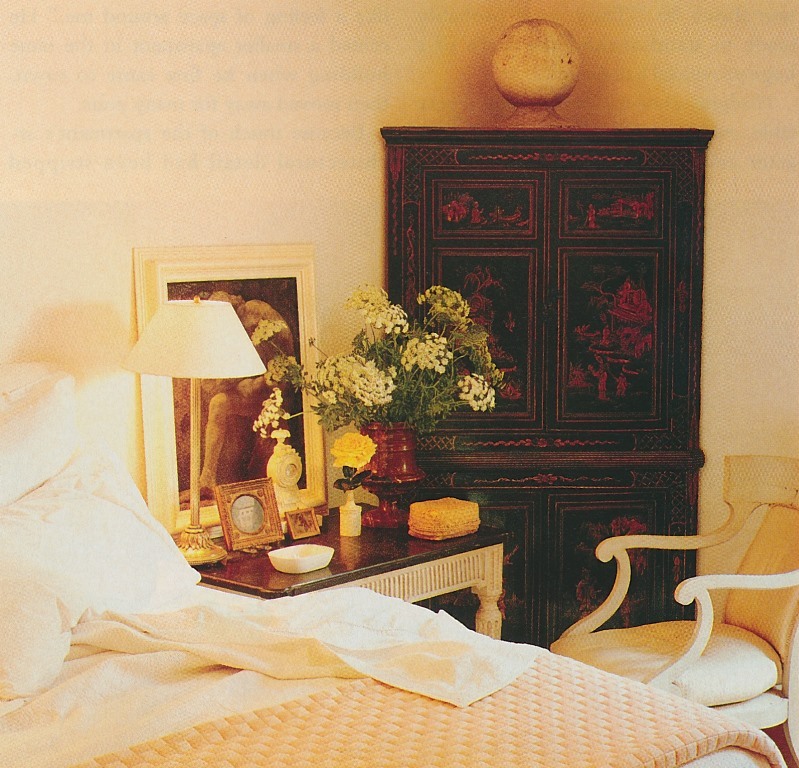 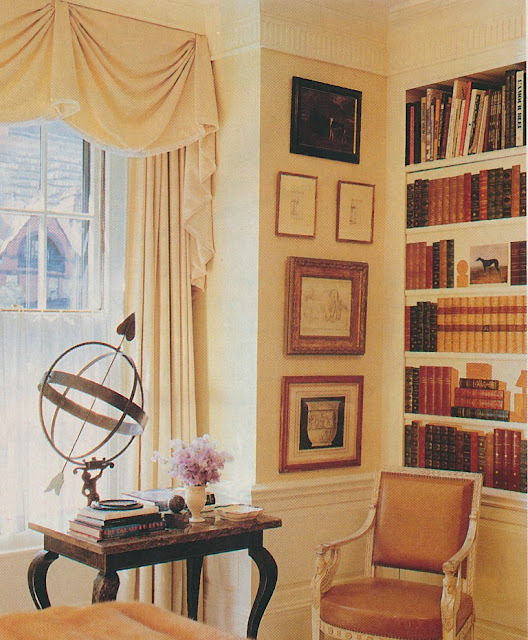 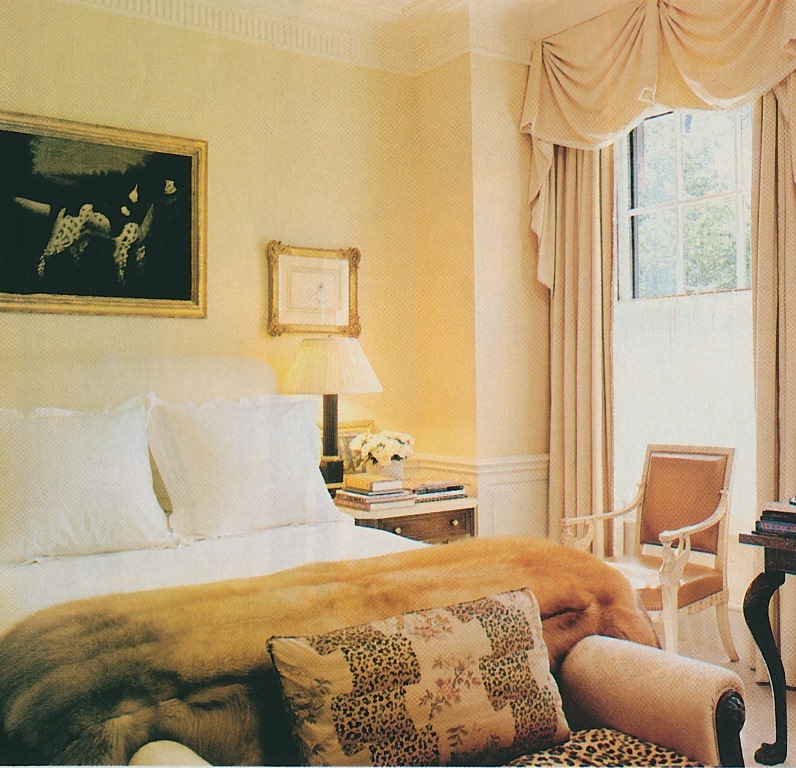 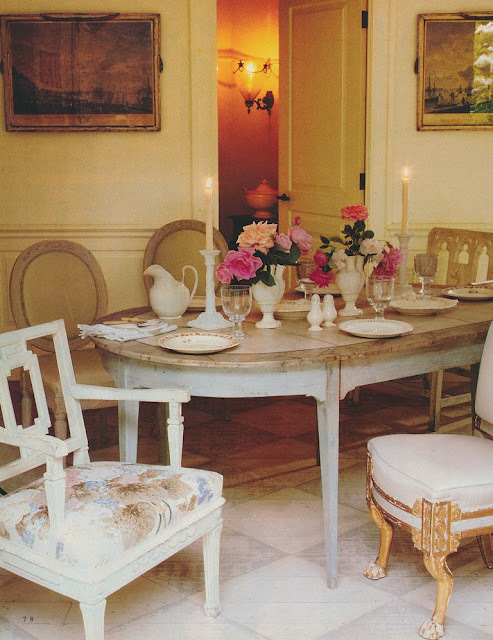 A good introduction to the work of Hodgins might be this early-1990's House Beautiful article, which featured both his gracious Back Bay apartment and his country house. In both homes, Hodgins has seamlessly blended elegance with comfort, traditional antiques with modern furniture, and American down-to-earth-ness with Continental sophistication, all underpinned by a neutral color palette and Hodgins's rigorous editing. 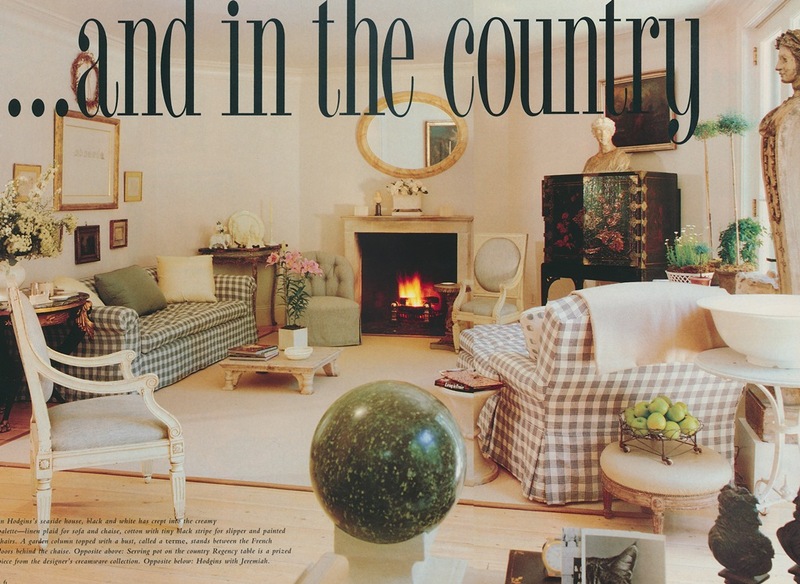 Also worth pointing out is the seemingly superb quality of both home's furnishings. 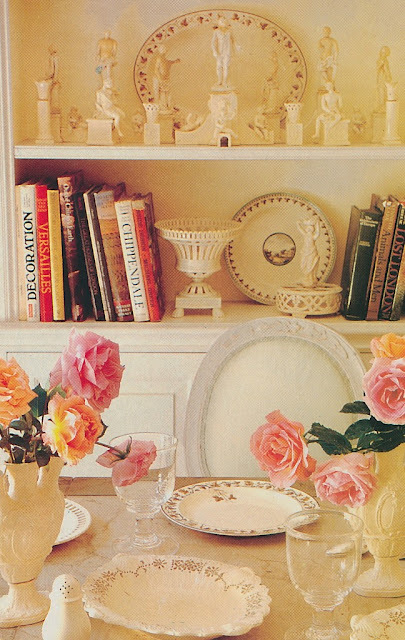 There are no junky accessories or random-looking pieces of furniture. 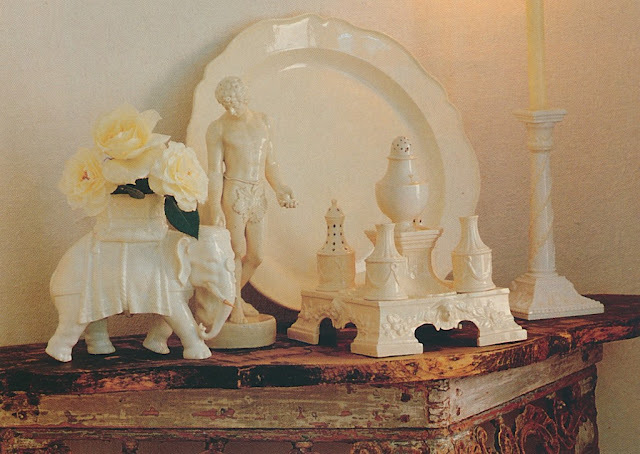 Everything seems to have been chosen with the utmost care. 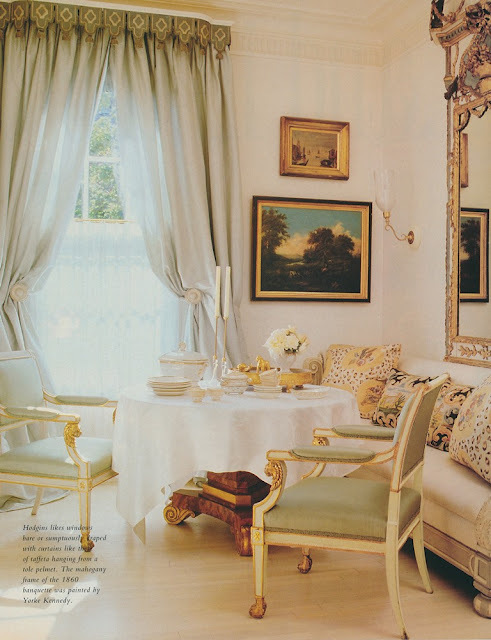 Then again, that neutral color palette requires superb furnishings, because those neutral tones just don't have the ability to mask inferior furniture and fabrics like robust colors do. 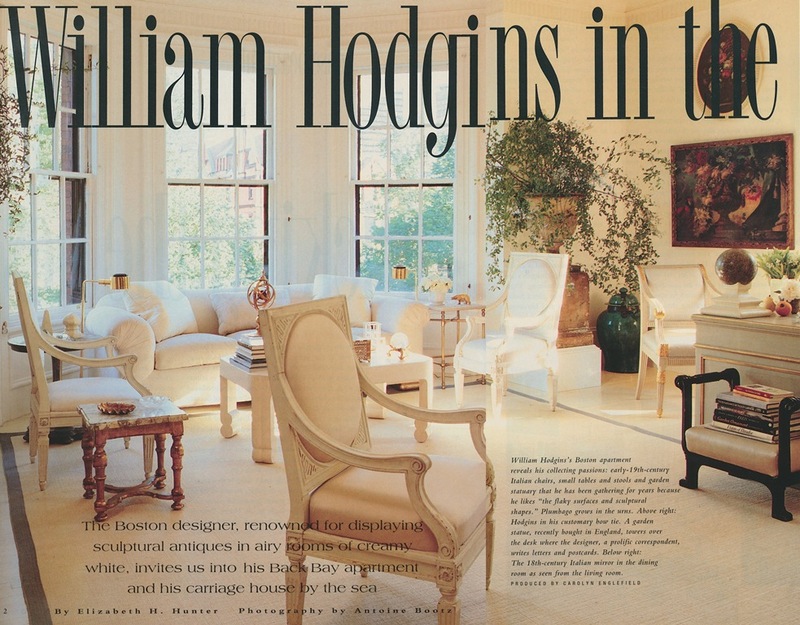 If you wish to see more of Hodgins's work, you might want to read William Hodgins Interiors by Stephen Salny. Although I have not read the book, it appears to be a monograph worth checking out. 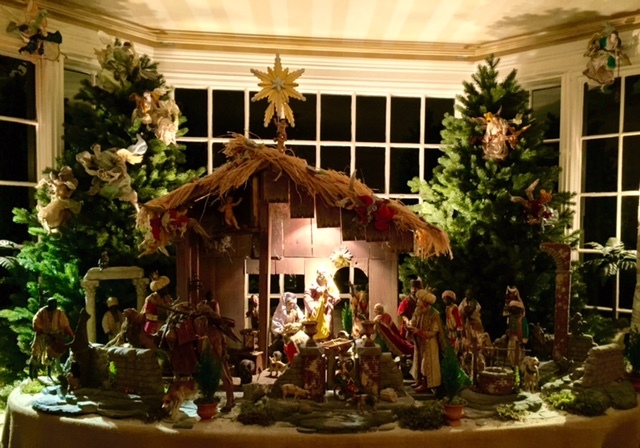 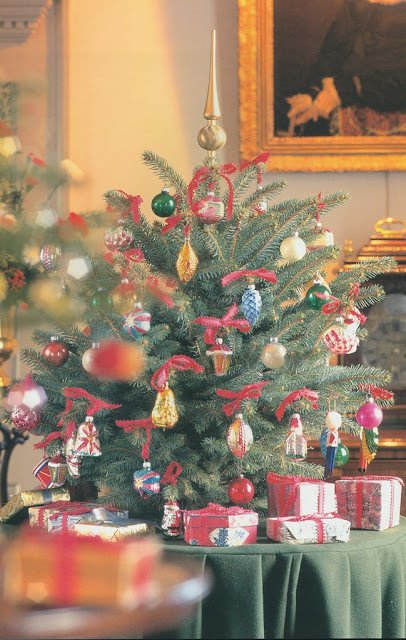 After publishing my December 1 blog post, which featured a London house that was decorated for Christmas, I received a number of emails from readers requesting that I publish more photos of traditional holiday décor. I've looked through some old December issues of various design magazines, and I've found a number of photos that will hopefully get you in the holiday spirit and give you a few ideas for your own home. 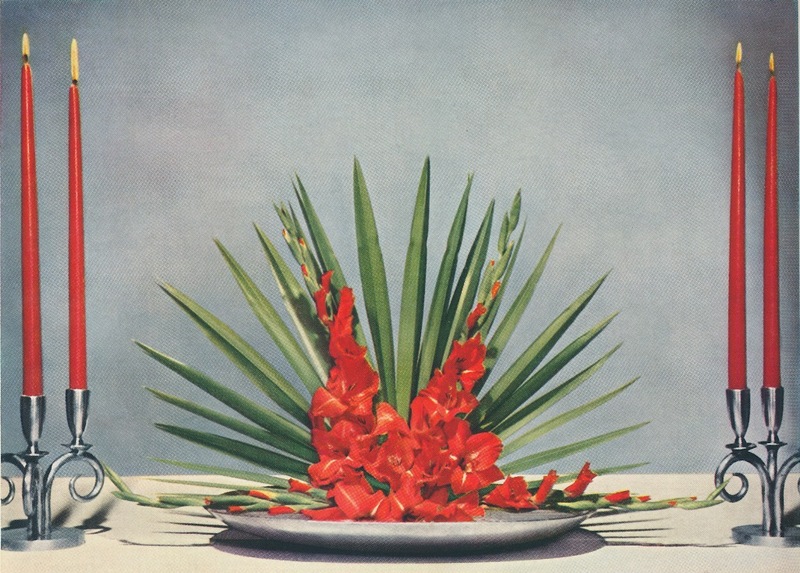 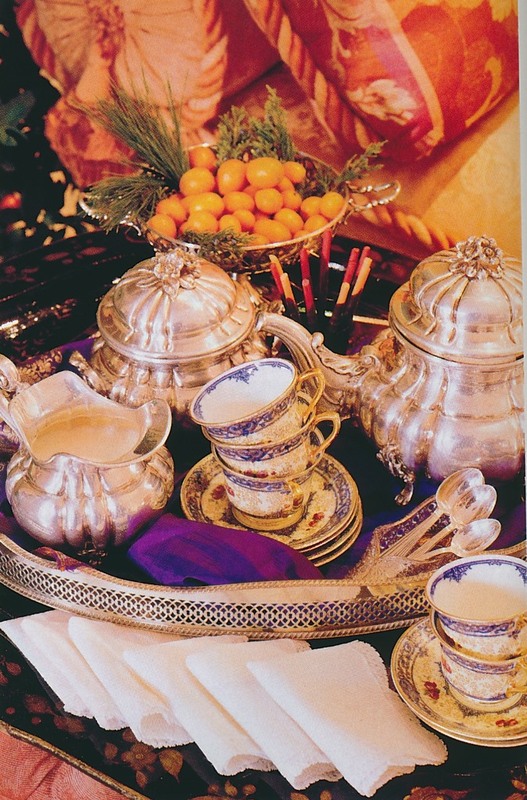 Here, the Gordons set a table fit for the season, laden with silver, crystal, pomanders, and white Amaryllis, all resting upon a red silk cloth. 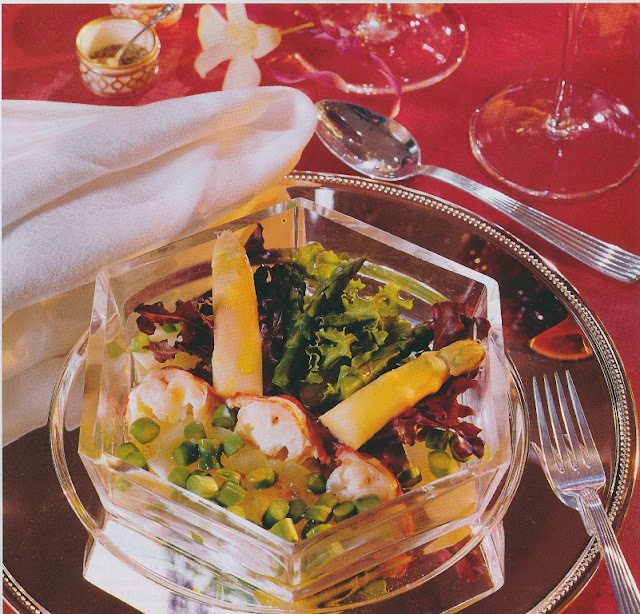 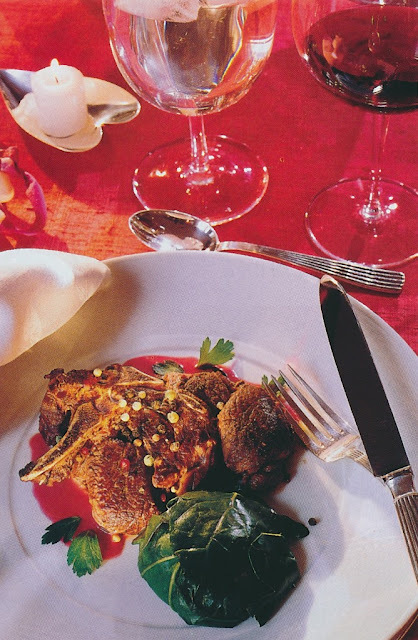 The menu consisted of Mignonettes of Lobster with Asparagus and Artichokes, Seared Venison Chops, Swiss Chard Timbales, and a Brandied Tangerine Tart. 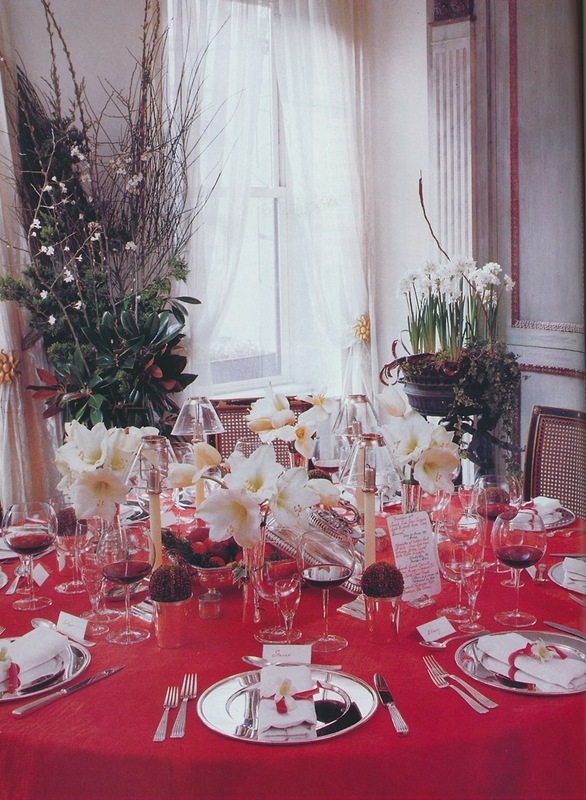 (I bet this menu did not appear in her More Style Than Money book, but then again, this was Christmas, a time when most of us blow it out.) 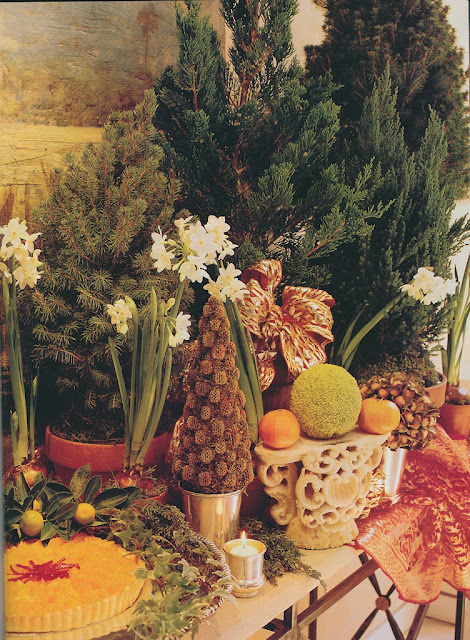 And then there was that side table, decked in pots of evergreens and paper whites. It's so festive-looking, the perfect perch for that tangerine tart.